Enjoying a day trip to the wine country isn't complete without the Wine Country Tote. It's an insulated two-bottle wine tote with cheese service, including a hardwood cheese board (6" x 6"), a stainless steel cheese knife with wooden handle, and a stainless steel waiter-style corkscrew. 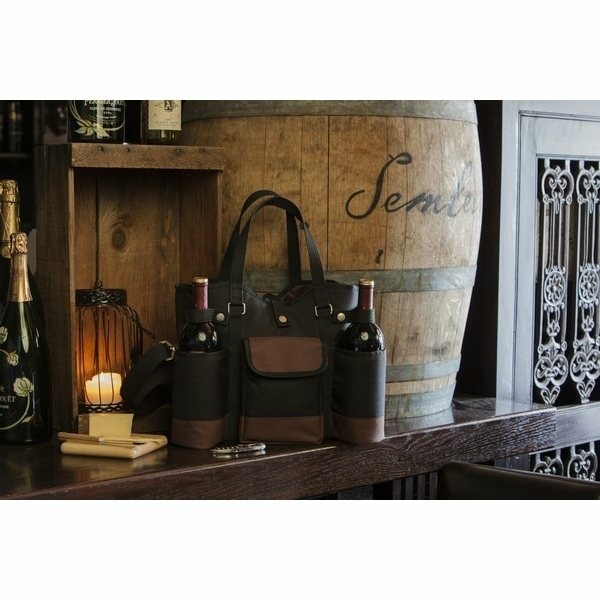 It features an adjustable shoulder strap, sturdy carry handles, two insulated wine bottle pouches, and a large compartment for food and sundries. Constructed of durable polyester with faux suede accents and complementing trim, this tote is the perfect gift for those who love to enjoy their meals outside, wherever life takes them. Love them! Everybody we give these to loves them - precisely the impact I was hoping for!! We were very happy with the quality of the material and the logo.